Have you ever started your day knowing that the word “mundane” just wasn’t going to apply? That’s how I felt this morning when I woke up in GUATEMALA! I’m here to participate in the fourth Birding Encounter courtesy of the Guatemala Tourism Commission. This noble enterprise has been conceived to promote bird watching and ecotourism in Guatemala, a Central American jewel oft overlooked by travelers. Frankly, I feel that selling Guatemala to birders should be about as easy as selling water to people whose hair is on fire. We’re talking about a country smaller than Tennessee harboring more than 700 bird species. The numbers do not lie: Guatemala is a birding paradise. This is not my first trip to Guatemala. I first had that pleasure when a day trip to Tikal was included as part of a larger Belize jungle vacation. In fact, that visit, with its profusion of phenomenal tropical birds, occurred just one month before I started 10,000 Birds. It would probably be accurate to say that Guatemala was instrumental to both this blog and my indefatigable desire for birding. As anyone who has visited the equinoctal Americas can attest, the Neotropics are a hard habit to break, particularly if you’re in a position to appreciate its embarrassment of biological riches. As thrilled as I’ve been to make this trip, I still wasn’t prepared for how beautiful Guatemala City appears from the air. The capital city sprawls with obvious ambition across a broad valley, but is still creased with deep, forest-lined crevasses. The complex topography of Guatemala City plays out on a smaller scale the grandeur of the surrounding mountains. It was to these highlands that we repaired as soon as our planes landed, “we” being me and some of the other Encounter participants. Without adequate time to show off a local preserve or finca (farm) but aware that we needed more than the ubiquitous Great-tailed Grackles and Black Vultures to get in the Guatemala groove, our incredible tourism ambassador Bitty brought us to her own house in the highlands. Sweet! In no time at all, I was exploring this fertile new ground, joined by the highly knowledgeable tropical birder and Nikon rep, Mike Freiberg. Soon we were into birds like Turkey Vulture, Eastern Bluebird, Wilson’s Warbler, Common Yellowthroat, Rose-breasted Grosbeak, and House Wren. “Wait a second,” you’re probably thinking (since saying that out loud might seem weird to whoever is sitting next to you,) “why would you go all the way down to Central America for the same birds you’ll be seeing once migration kicks in. Sure, Guatemala is the winter home for tons of beloved United States migrants, but it has a lot more than that going for it. 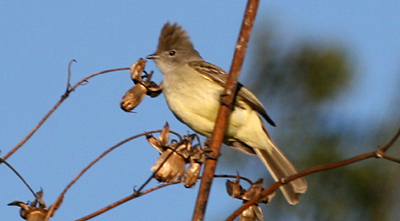 For example, instead of American Robin, I saw Clay-colored Robin, with abundant Rufous-collared Robins to boot, in place of Red-bellied Woodpecker, I saw Golden-fronted Woodpecker, and rather than Northern Mockingbird, I saw Tropical Mockingbird (though that last one doesn’t represent much of a difference.) The fact is that spotting a male Baltimore Oriole in full, incandescent orange plumage is always special, particularly when it’s two branches down from a Social Flycatcher. Yes, the highlands had plenty of outstanding birds, and more than a few new ones, for me. 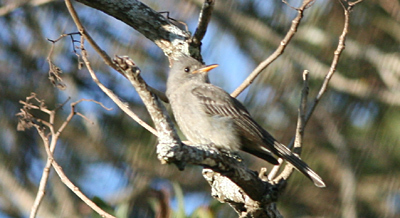 Gray Silky-Flycatchers, for example, are gregarious spitfires whose cacophonous squawks can be heard incessantly throughout the highlands. They’re also worth paying attention to as the vivid yellow of their yellow untacs contrast nicely with their dove gray plumage. Band-backed Wrens are pretty spectacular themselves, garbed in a motley of black and white stripes against rich cinnamon. Encountering a small group of these striking wrens occupying the branches of a tall pine was one of the highlights of the outing, Another was an admittedly drab, but still desirable Contopus flycatcher; the name Greater Pewee may sound somewhat oxymoronic but it sure looks great on my life list. Buff-breasted Flycatcher, Dusky-capped Flycatcher, Lesser Goldfinch, Yellow-bellied Elaenia, and Rufous-collared Sparrow also featured prominently in our late afternoon birding. One of the most interesting sightings was Townsend’s Warbler since (a) I didn’t expect western wood warblers, (b) this brilliant bird in full dazzling plumage was my first, and (c) there was apparently plenty more where this one came from. However, that is a story for another day. Suffice to say, as twilight deepened and Cattle Egrets soared overhead to their evening roosts, I knew that this brief foray into Guatemala highland birding heralded even better things to come. Great article with useful information. Thank you for posting! This is Sara writing. Why do you think it is strange to say ‘wait a second’ out loud? Seems perfectly normal to me. Sara, I know that wouldn’t be weird for you, but some people are a bit more repressed! Corey, it’s true that I haven’t seen Brown Creeper here but so far I have racked up Streak-headed, Wedge-billed, and Ivory-billed Woodcreepers. A fair exchange, wouldn’t you say? Ivory-billed Woodcreepers? How did you tell them from the superficially similar Pileated Woodcreeper? Easy: Ivory-billed Woodcreepers always perch behind the tree, Pileateds in front of the tree. That’s why teams of birders, who would be able to check both sides of a tree simultaneously, will never ever manage a record of an Ivory-billed Woodcreeper. Well Mike, you really took me back. My wife (before she was my wife) and I went to Guatemala back in 1976 and had some of the best, most relaxing times of our lives there. We stayed for a month at a place called Lake Atitlan about 60 miles West of Guatemala City. It is a caldera lake in the highlands of Guatemala surrounded by three volcanoes. One of the coolest things about our trip was a huge double rainbow stretching over the highway as we entered the country. Unfortunately, I didn’t know about birding back then but I’m sure it is a magnificent birders paradise and after reading your post, I think I will plan another trip to Guatemala. I would go there just to see the Ivory-billed Woodpecker plus the natives were some of the friendliest and honestly real people I’ve ever met anywhere. We still have a hand woven wall hanging of a Quetzal bird hanging in our home. Did you see any of them while you were there? so now that you´re back in N.Y., I want to share part of a birding day around Lake Atiltlán. Starting early morning, together with Jim, Jeff, and Terry (US), Tim (UK), and Irene and Ana Cristina (Guatemala), we crossed the lake in a small boat to our prior scheduled destination: San Pedro Volcano. Two local guides joined us in our birding day. We walked up around 4 hours into this steep and variable habitat of the volcano, from a dry forest in the bottom, to a humid cloud forest in the summit. After been in almost complete silence, except for all the birds calling and singing since we started 4 hours before, finally a big bird was detected by its movement into dense folliage, in branches around 30mts distance from the trail: “Horned Guan” we exclaimed, all the group was watching two birds feeding at 20m from the ground. That single species made the day for several birders in the group, including the guatemalans. Some other highlights included Lesser Roadrunner, Blue-throated Motmot, Wine-throated Hummingbird, Sparkling-tailed Starthroat, Gray Silky-flycatcher, Bushy-crested Jay, Black-capped Swallow, and Prevost´ Ground-Sparrow, among others. Hugo, that’s an incredible report. I’m really jealous, as that is the post tour I would have done if I was able to stay! I had a great time birding with you, especially around Antigua. Larry, as you might be able to surmise, I haven’t been to Lake Atitlan yet. I haven’t seen any Quetzals either… yet! I think I’ll also plan another trip or three to Guatemala. Where Are You Birding This Fourth Weekend of January 2010? Where Have all the Ducklings Gone?